The report was released by the Missouri Department of Elementary and Secondary Education (DESE). The district earned 108.2/120 points. The chart below reflects the district’s scores in recent years. “We feel very good about our score for this year as it validates some of the hard work that our district personnel has done the past few years. 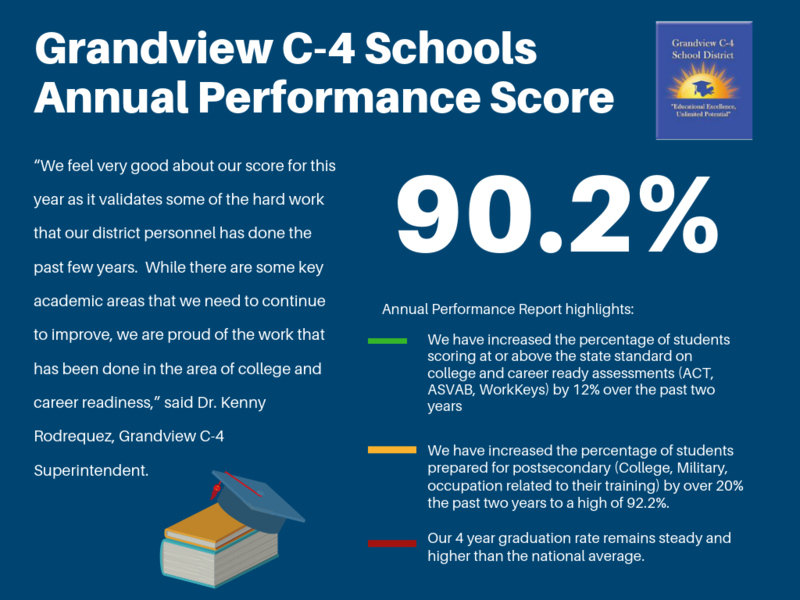 While there are some key academic areas that we need to continue to improve, we are proud of the work that has been done in the area of college and career readiness,” said Dr. Kenny Rodrequez, Grandview C-4 Superintendent. We have increased the percentage of students prepared for postsecondary (College, Military, occupation related to their training) by over 20% the past two years to a high of 92.2%. Our 4-year graduation rate remains steady and higher than the national average. “These scores and highlights continue to build upon the momentum the district has shown over the past year and a half. We are proud of our students, our staff and our community and will continue to work toward achieving our mission of ALL students being college and career ready," said Rodrequez.